A chopper is a static device that converts fixed dc input voltage to a variable dc output voltage directly.Â A chopper is a high-speed on/off semiconductor switch. 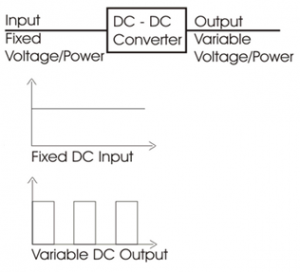 It connects source to load and disconnects the load from source at high-speed.Â Also known as dc-to-dc converter.Â Widely used for motor control.Â Also used in regenerative braking. In step up chopper output voltage is more than input voltage. In step down chopper output voltage is less than input voltage. Figure below shows the basic block diagram of chopper. 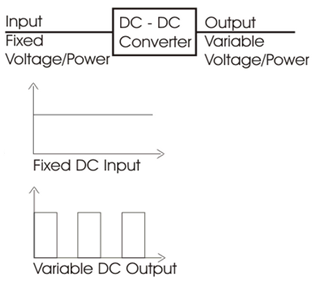 Basic principal behind the chopper is it converts Fix DC input voltage to Variable DC output voltage. Low power application: GTO, IGBT, Power BJT, Power MOSFET etc. High power application: Thyristor or SCR. â€¢ They are used for DC motor control (battery-supplied vehicles), solar energy conversion and wind energy conversion. â€¢ Choppers are used in electric cars, airplanes and spaceships, where onboard-regulated DC power supplies are required. â€¢ In general, Chopper circuits are used as power supplies in computers, commercial electronics, and electronic instruments.